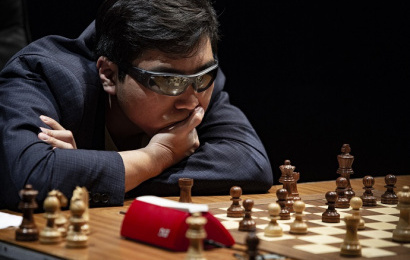 The Philippines born US star Wesley So has won his second consecutive Leon Masters after needing tiebreaks to beat Spanish no. 1 Paco Vallejo in the final. Paco was the dominant force in the rapid games, but So demonstrated his defensive gifts again and again to take the match to blitz, where he overcame his rival. Wesley didn’t only win the tournament but also won over the public with his good humour and entertaining interventions in the press conferences. The final got off to a fierce start, as Paco Vallejo demonstrated excellent opening preparation and had his opponent in trouble. Wesley So sacrificed a piece in the opening, but when he failed to find the correct continuation he simply ended up in a lost position. Although the white pieces are somewhat more active it seems insufficient compensation for the loss of the e-pawn. Paco committed an inaccuracy, however, and So was able to equalise the material until a little later on the decisive moment arrived. So is threatening the black bishop, which could have been defended with 28…Qc7, when the game would probably end in a draw. Paco missed his opponent’s idea, though, and played 28…Rfe8?, which lost on the spot to 29.Rd4! Qc7 30.Rde4. The pin is lethal, and shortly afterwards Vallejo lost the bishop and the game. The first game of blitz was again similar, up to a point. A good opening idea from Paco Vallejo left Wesley So in an uncomfortable position. With the precise 25.Qc2! White could have prevented the black queen from being transferred to the centre, since 25…Qe5 would be met by 26.Ng3. In the game 25.b4!? followed, and the black queen soon found itself on e6, from where it controlled the whole board. Just when the game seemed to be heading for a draw Paco forgot about a pawn and Wesley So converted his advantage into a crucial win. In this position the plan of advancing the h-pawn to create weaknesses around the white king is probably the most promising, but Paco couldn’t resist the beautiful 28…Nh3+. Black would love White to take the knight, but instead So played the calm 29.Kh1!, gently requesting that the knight retreat. That didn’t happen, though, since Paco committed the decisive mistake 29…Qh4?. Wesley replied 30.f4! and shortly afterwards won a piece and the tournament – Wesley offered a draw at the end in a won position, since that was all he needed to confirm tournament victory. This was a very tough match. Paco played really, really well and I think he had very good chances to win the match, because he had very good positions in almost all the games. I think he played really well… and also quite badly! So that’s all for the 31st edition of the Leon Masters, which provided three dramatic matches and saw the elite debut for 12-year-old Praggnanandhaa. It was a rocky ride, but Wesley So was a deserving winner who once again demonstrated his strength in speed chess. He’ll get a chance to do the same in just over a month, when he plays in the next Grand Chess Tour event, the St. Louis Rapid and Blitz. That runs from the 11-15 August, and will be followed shortly afterwards by the Sinquefield Cup. You can check out all the upcoming top events in our 2018 Chess Calendar.